Going to church this weekend? Yeah. Me, too…Church Rocks. It’s great! 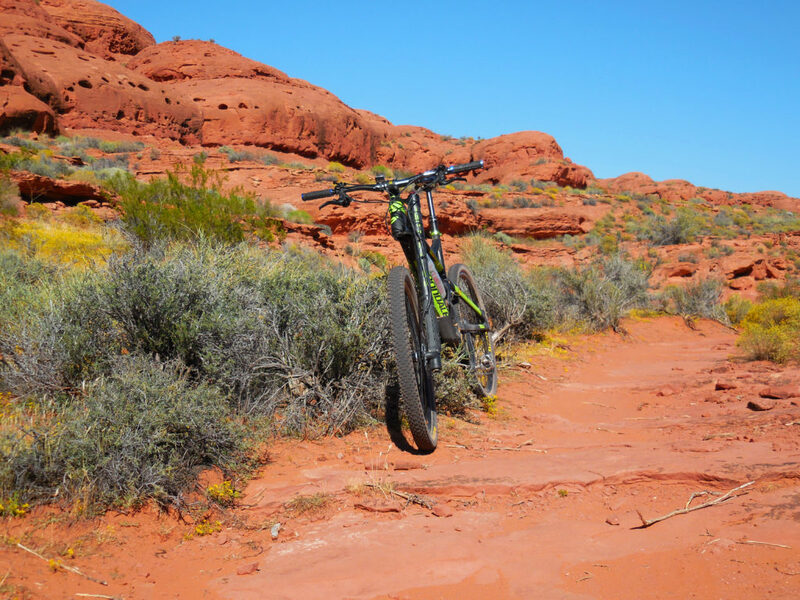 It’s a lollipop-type trail with rolling desert singletrack for the start and finish and a few miles of mostly slickrock challenge for the “lolli” when you begin, as I usually do, at the Cottonwood Trailhead off of Highway 9. The singletrack out of the trailhead is a sublime mix of climbs and descents short enough not to punish those off their game yet long enough to make a seasoned rider smile or furrow their brow, depending on their strengths. The ups will make you breathe hard, but just as you’re tiring, the summit appears. With a couple of clicks of the shifter, you’re rolling over the top and blazing down into the next valley, recovering from the climb if you can hold back your downhill greed enough to relax before the next up. There’s a section right after a slickrock “wall” that most people—other than a few brave ones—will walk down. I call it the Purple Zone due to the colorful clay it runs through. It is twisty and fast in either direction, runs between and around sage and creosote, goes up over rises and rocks, and even has a few booters on which you can catch air, if you’re so inclined! This is one of my favorite pieces of trail—anywhere! Even though Church Rocks runs parallel to Interstate 15, it doesn’t feel that close to civilization. 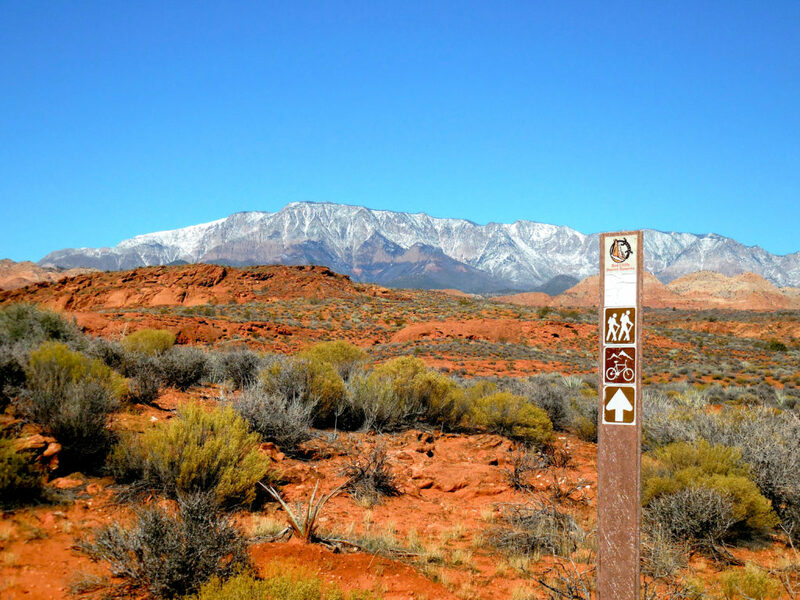 Sure, you can see and hear the traffic, but the trail is situated in the foothills of Pine Mountain, so the beauty and vast views—including Zion National Park from afar—are enough to distract you from the temptations of the day to day world. There are sandstone formations jutting up from the desert floor with shapes that fire the imagination, including a cathedral-looking hill that I assume was the namesake of the trail, though I’ve heard several stories of how the name came about. Soon, you’ll come to the loop end of the trail, which climbs to the top of some of the red and white sandstone cliffs that you’ve surely been mesmerized by as you approached. While the climb is steep, it’s relatively short, and the run along the bench at the top heading back around the loop is not to be missed. The drop from the top back to the junction for the return trip is a stair-steppy test of your mountain biking will and skills that rewards you with a very fun and fast run back to the car. Church Rocks is a place people go to praise the bike, Mother Nature, or maybe even the Lord. This praise can be for the beauty of the place, for the experience of cycling, or for having survived that almost certain endo when you hit that rock wrong! Whether it’s a religious experience or just a fantastic day on your mountain bike, you should really go to Church… Rocks.